You are here: Home › Best Practices › Document Scanning › Enterprise Content Management › Celebrate World Paper Free Day! Celebrate World Paper Free Day 2016 this week with MTS Software Solutions and our partners at AIIM (the Association for Information and Image Management). AIIM has designated Friday, November 4 as World Paper Free Day 2016. Like our information management colleagues at AIIM, we understand that information is one of the most important assets of an organization. Yet, there are many organizations who struggle to capitalize on the abundance of information relating to their business, because that information is held captive on paper. Wait, bathrooms?!? Maybe you remember the toilet paper commercial by Le Trefle, the French toilet paper company? While it’s true that there is significantly less paper in the workplace today than years ago, there are still many businesses and business processes that rely on paper. Further, there are boxes and filing cabinets filled with valuable business information in companies of all shapes and sizes ranging from the Fortune 500 to local non-profit organizations. You might think that with all of the available technology from smart phones to intelligent data capture that most businesses would be paper free by now. Yet, many are not. We know, because we help our customers solve paper problems every day. We know, because we help our customers solve paper problems every day. How can YOU celebrate World Paper Free Day? 1. Register for the World Paper Free live webcast. Join AIIM and MTS partner, ABBYY, for a live webcast on Friday, November 4th at 10:00 EDT. The digital event will feature tips and tricks from AIIM members who can share their own experiences as they transformed business processes and reduced paper. You can register for the live webcast here. 2. Eliminate paper in your office and capitalize on the information it contains. 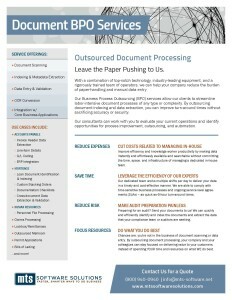 One way to reduce paper in your workplace and realize the benefits of having all of the information and data on your paper documents is to outsource the scanning and indexing of that paper. We offer Document Business Process Outsourcing (BPO) services that leave the paper pushing to us and allow you to stay focused on delivering value to your customers. You don’t have to take our word for it. Hear from one of our document scanning customers in this video testimonial. Download our Document BPO Services brochure. 3. Get a Paperless Audit. 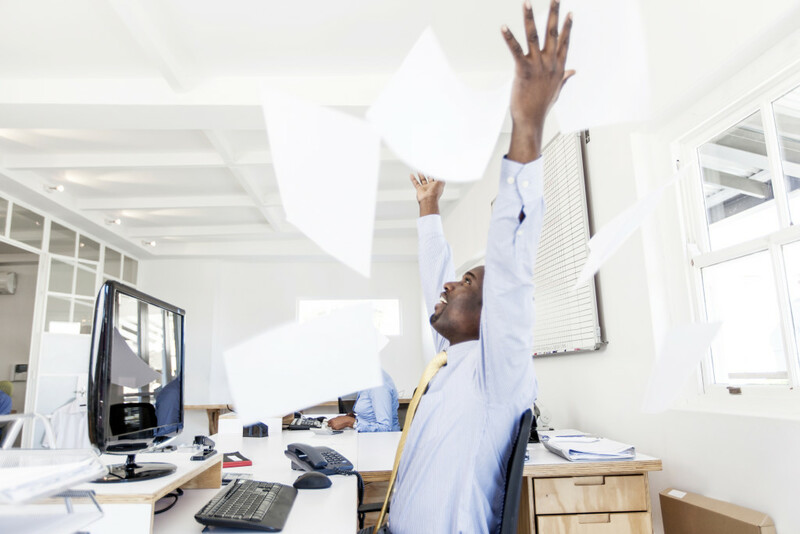 Reducing paper in the workplace is not just about back-file or day-forward scanning. It’s about continually evaluating and re-evaluating your business process in order to identify opportunities for improvement and added efficiency. It’s about knowing what state-of-the-art document and content management technologies exist and the industry best practices in order to make them sing at your organization. This requires a lot of time and effort. That’s where our team comes in. We offer ECM Consulting Services to help our customers stay ahead of their industries and stay away from processing paper. Don’t let this year’s World Paper Free Day pass you by without taking some steps to finally take action and reduce paper at your organization.